All Replies on Dyed shou sugi ban ? Dyed shou sugi ban ? This was interesting looking enough that it inspired me to do some searching. 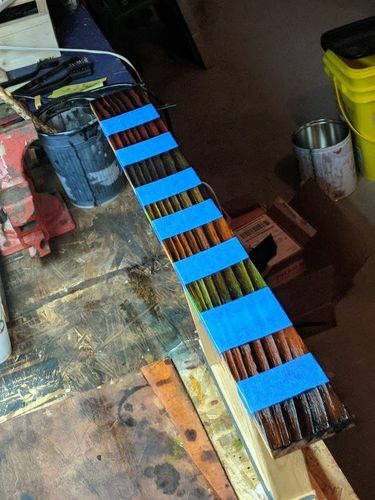 According to the article at the link below it sounds like the wood is burnt first and then a colored stain is applied after. Ok. So it seems the difficult (at first) part would be knowing how charred to make it before staining. Too long and the ash would be too set to accept the dye. There is a big difference between outdoor and indoor furniture with the shou sugi ban. Indoor you can get away with more experimenting, but outdoor furniture you’re looking for protection. I make and sell outdoor furniture and due to the rising price of western red cedar, I’ve had to find a low cost, time and money, way to recoup the extra the wood costs. I thing shou sugi ban is perfect, except for those who like light stain. You can’t do light with that technique. I just made my first shou sugi ban Adirondack today. I’m very pleased with the way it looks and that it will likely last 20 years without much change in its looks. I use a roofing torch to just aligator lightly, then a stiff large wire brush, then I turn the hose on it with a stiff nylon brush. After it dries, I use a combination of tung oil and danish oil, fruitwood color to give the shinny spots some color. I am trying to research this idea. I already use the Shu Sugi Ban technique for my work, but I have a commissioned piece for a Chicago Municipal Flag. This requires a color close to baby blue. I am trying to find a way to Sugi Ban, then white wash and dye with colored stain to achieve the light blue effect. I haven’t tried on any scrap yet. Has anyone else done this? -- Anybody can become a woodworker, but only a Craftsman can hide his mistakes! I am trying to research this idea. I already use the Shu Sugi Ban technique for my work, but I have a commissioned piece for a Chicago Municipal Flag. This requires a color close to baby blue. I am trying to find a way to Sugi Ban, then white wash and dye with colored stain to achieve the light blue effect. I haven t tried on any scrap yet. Has anyone else done this? Use a propane torch to blacken the wood. Start evenly browning slowly over and over until it’s almost charred on the surface. Sometimes on the knots you need to get it glowing red. If the wood catches a small flame, just blow it out, no biggie. Then let it cool down a smidge and use a wire brush. I prefer stainless steel. Rub all that carbon char off the piece. You will have some 3d grooves of the darkened grain and then the light colored wood (I’ve used Pine mostly) underneath. Once the piece is all cleaned up, use a pre-stain (In this case I used Water Based pre-stain) and mix 1 tbsp of 70% alcohol per 10 drops of food coloring. You can look up different food coloring combinations online.. for example 19 drops of red and 2 drops of blue would be a bright watermelon color… etc. Or 24 drops of yellow and 2 drops of green will be Lime. Doing one side at a time, rub the stain on and then immediately rub it off. If the color needs to be darker, adjust the coloring mix, etc. It is kind of a trial and error thing. Here is a color pallette I did to test. Inspire Woodcraft has a 4 part series on shou sugi ban and color dyes on youtube. Here's Part 1. He goes through all of his trial and errors and gives a bunch of recommendations, from which wood to use to which finish to use for your particular desired look.